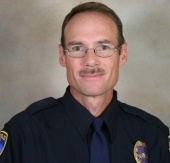 Randy Farris is an officer with the Bakersfield Police Department in Bakersfield, CA. In early 2007, I started experiencing difficulties while eating. Often times my chest would tighten up, causing problems with my ability to breathe and swallow the food I was trying to eat. This condition led me to change my eating habits which ultimately did nothing to reduce the symptoms, and caused me to start losing weight. In May of 2007, I had an endoscopy, which is basically a flex tube camera being sent down your throat to get a first hand look inside your stomach. A tumor growing in the lower section of my esophagus was located and a biopsy of the tumor was found to be cancerous. This tumor was the source of my discomfort when I would try to swallow food. I was somewhat surprised by the results because I am not a usual candidate for this type of cancer. I was 45 years old and in good health. I did not smoke or use any other tobacco products; I was a light drinker, and not overweight or experiencing acid reflux symptoms. In June, 2007, I had surgery to remove the tumor at USC Medical Center. This is a complicated six to eight hour surgery which involved the removal of the esophagus above the tumor and part of the stomach below the tumor. The remaining portion of my stomach was restructured and attached to the remaining esophagus. The lymph nodes around the stomach area were also removed and tests determined that my cancer had not spread, therefore, chemo or radiation treatment was not required. I was at USC for 13 days before being released. I was on a liquid diet with most of my nutrition coming from a “J” tube connected to my stomach. About six weeks after surgery I was able to maintain my weight without having to use the “J” tube, which gave me my first real sense of normalcy following the surgery. I was on sick leave from work for three months before returning to “light duty” which is still my current status. This surgery caused me to lose 35lbs and a lot of my strength. My strength is slowly coming back, but I have yet to gain the weight back. Diet related issues and acid reflux are my biggest obstacles that I have yet to overcome. I believe I will return to full duty with the continued support from my family and department.